You have probably heard the term “Smart Home”, but what exactly does it mean? Home automation is the centralized control of many features including, but not limited to: home security, lighting, thermostats and more. Home automation allows you to remotely control and manage these devices, usually through APPs on your phone. Having home automation devices makes your home “Smart”, thus came the popular term “Smart Home”. 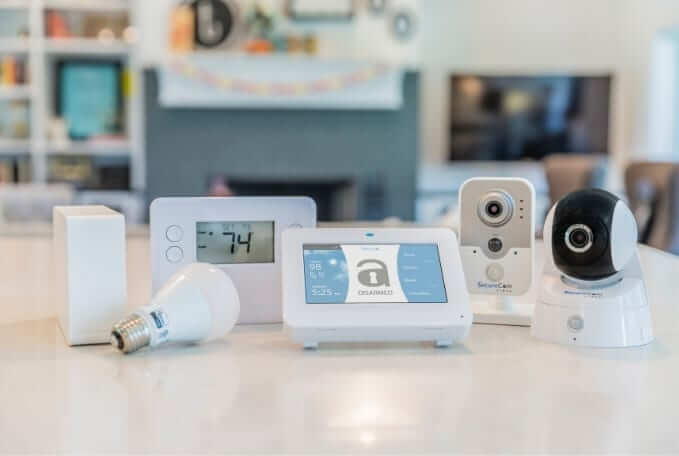 There are so many Smart Home brands and devices for you to choose from these days – the end goal being that they connect your home and make your life easier. Here is a preview of some of the features and benefits of having a smart home. One of the great features of smart home security systems is that you can arm and disarm your security system at the push of a button and it doesn’t matter where you are. Some APPs will send you notifications when your alarm is going off. View live video in and around your home. Watch your dog, view your property, or use it as a baby monitor. Cameras can be placed almost anywhere you want. Connect floor lamps, table lamps and built in lighting. Put it on a timer to turn on right before you get home from work. Forgot to turn the lights off when you left the house? No problem, control it from your phone. Automated lighting systems are convenient and simple to use. Put your thermostat on a timer – make it colder at night when your home and warmer throughout the day when your not. Also, save a little bit on your electricity bill. Add automated door locks to your main entry doors and never need a key again. Also, forget handing out keys to your home. Give each person their own code and delete that code when that person no longer needs entry to your home. Receive a notification if you accidentally left your garage door open and then close it right there. No need to drive home or just hope that nothing gets stolen from your garage or home! Want to see who’s at your door before answering it – or even when you not there? Doorbell cameras are a popular new feature that combine convenience and security. From toaster ovens to coffee makers, anything with an on/off switch can be connected.